We are proud to be such a significant part of the area’s health community. Our vision is to provide the best medical treatment possible and to work closely with your referring physician or optometrist to provide the highest quality eye care. The following pages and links will provide you with several resources that will aid in understanding the eye and our role in providing the best possible care. The human eye is incredibly intricate with many different parts. 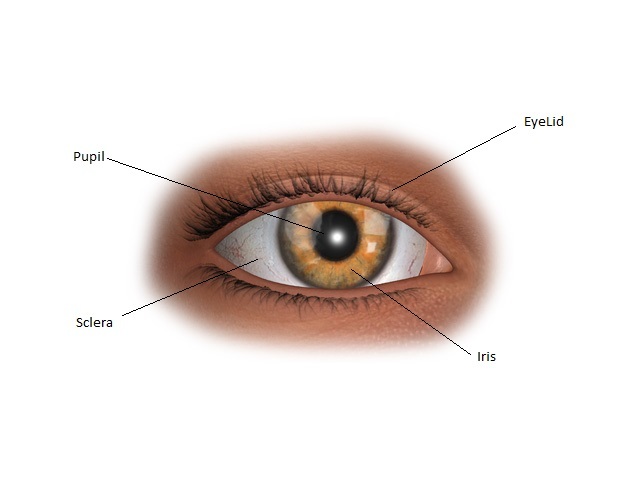 In this section we will explain its basic structure and the purpose of its various features.The eyeball itself is roughly spherical and sits in the eye socket. The eye socket is also known as the orbit. The orbit is covered in fatty tissues which surround the eyeball. This fatty tissue acts as protection from the walls of the orbit. The eye also has many other protection mechanisms so that it will not be injured, which we will see shortly. Six muscles are attached to the outside of the eyeball. These muscles control the movement of the eyeball. These muscles allow the eye to move around, allowing us to look at different places in our field of vision without moving our heads. From the back of the eyeball extends a thick cord of nervous tissue called the optic nerve. This collection of neurons (nerve cells) carries signals from the eye to the brain.The eyeball is surrounded by a thick wall, which is tough and composed of three layers. The wall protects the eyeball from pressure. Inside the eyeball is a substance known as vitreous, which is a thick, jelly-like material that maintains the shape and pressure of the eyeball. It makes up roughly 80% of the eyeball.The outer layer of the wall of the eye is composed of the sclera and cornea. The sclera covers the white of the eye, which is roughly 5/6 of the eye surface. The cornea covers 1/6 of the eye and is on top of the colored part of the eye. The sclera and cornea feel like soft leather to the touch, and are relatively dehydrated. They serve to protect the inner parts of the eye from the environment. The cornea also does most of the focusing of the light that comes into the eye.The middle layer is called the choroid, which contains the iris, lens, ciliary body, and the pupil. The ciliary body protects the lens and changes its shape to modify the eye’s focus point. The iris is the colored part of the eye and may be blue, green, gray, or brown. It absorbs light and protects the sensitive retina from excessive light. The cornea sits on top of the iris, and the space between is filled with aqueous humor, which is a watery liquid. The black opening in the center of the iris is the pupil. Muscles in the iris control thse size of the pupil and thus the amount of light that reaches the retina. You can test this if you stand in front of a mirror, turn off the lights and wait for a few minutes, and then turn the lights back on, you can see that your pupil becomes dilated (much bigger) in order to admit more light. The lens is yellow-colored and absorbs ultra-violet light so that it can’t damage the retina. Its principal purpose is to fine-tune the focusing done by the cornea. It makes objects that you are looking at come sharply into focus. It does this by modifying its shape, to account for different distances between the eye and objects. It is elastic and is made of living cells, like most portions of the eye. Things called ciliary muscles control suspensory ligaments, which modify the shape of the lens. The inner layer of the eye is composed of the retina, which receives the light focused by the cornea and lens. It detects the presence of light and its color, and sends this information to the brain for processing. The retina is lined with cells called photoreceptors. There are two kinds of photoreceptors: rods and cones. Rods detect the amount of light, whereas cones are stimulated by specific colors. If you had no cone cells, then you would be color-blind and would only be able to tell the amount of light present and not its color. When light hits the retina, different cells are stimulated in different locations. This map of stimulation corresponds to the world outside and is transmitted to the brain for processing and eventually turns into what we see.Nerve cells are called neurons, which make up much of the brain. They conduct the electrical impulses which allow us to see, as well as think. Neurons have three main sections. These are the dendrites, cell body, and axon. The dendrites are like long fingers that extend from the cell body and connect to other neurons’ axons. When a neuron fires, an electrical impulse travels down its axon into the dendrites of the next neuron. This next neuron usually then fires as a result of the stimulation caused by the signal from the first neuron. Neurons carry complicated electrical signals all over the brain.Photoreceptors are a type of neuron, except they are stimulated not by other neurons, but by light. When the photoreceptor cells fire, they activate cells called bipolar cells, which fire in turn and activate ganglion cells. Ganglion cells make up the optic nerve, which extends into the brain. Thus, the original light is detected by photoreceptors in the eye and then the corresponding electrical signals travel from the photoreceptors to the optic nerve, where they are carried to the brain.Other neurons in the eye are also important. One such type of cell is the horizontal cell. It lies perpendicular to the photoreceptors and allows them to communicate. It is thought that horizontal cells help to increase the contrast with which we see, allowing us to distinguish objects better. Another type of neuron in the eye is the amacrine cell, which also lies perpendicular to the photoreceptor-bipolar-ganglion pathway. It provides a means for ganglion and bipolar cells to communicate and is thought to help us distinguish movement. Downloadable files are available on various topics in our Eye Fact sheets library. the PDF files for you.